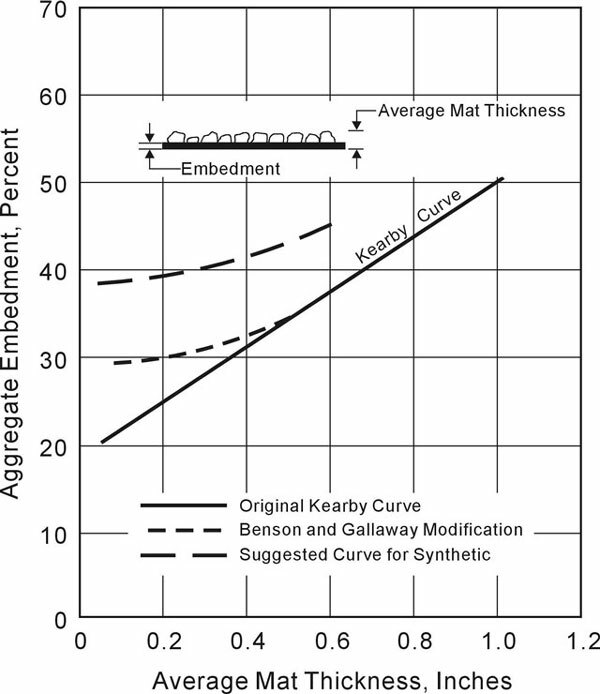 The design method described in this section is based on a modification of the original Kearby method and was first recommended to TxDOT by Texas Transportation Institute in 1981 (Epps et al., 1981). It is still the method most commonly used by TxDOT today. A formal design method such as this can effectively serve to guide inexperienced personnel through the “art” of seal coat design and to train personnel including inspectors, designers, and laboratory personnel. Correction factors for binder application rates for varying conditions including traffic and surface condition may be developed for conditions unique to a district and will ensure a much faster learning curve for inexperienced personnel. Examples of some adjustment factors, which were developed by the Brownwood and Abilene districts, are shown in Appendix A. Sample calculations are shown in Appendix B. A design method such as described herein should be used to determine initial binder and aggregate application rates, but it should not take the place of good engineering judgment. Field conditions will require the adjustment of both binder and aggregate rates. Aggregate Spread Rate. The Board Test is used to find the quantity of aggregate on a board of known aggregate such that full coverage, one stone in depth, is obtained. A one-half square yard area is a convenient laboratory size. The weight of aggregate applied in this area is obtained and converted to units of pounds per square yard. Good lighting is recommended and care should be taken to place the aggregate only one stone deep. The quantity of aggregate needed to cover one square yard of roadway can also be determined in terms of volume as shown in Equation 4.1. Q = aggregate quantity determined from the board test (lbs/SY). Asphalt Application Rate. The asphalt application rate for asphalt cement can be obtained from Equation 4.2 once the aggregate properties and existing roadway conditions are known. V = correction for surface condition (see Table 4-2). e = percent embedment expressed as a decimal from Figure 4‑1. W = dry loose unit weight in lbs/CF. Anchor: #i1001499Table 4-1. Asphalt Application Rate Correction for Traffic. Anchor: #i1001524Table 4-2. Asphalt Application Rate Correction for Existing Pavement Surface Conditions. These surface conditions may vary throughout the project, and adjustments should be made accordingly. Atheoretical = theoretical quantity of emulsified asphalt, (A/R). R = percent residual asphalt in the emulsion expressed as a decimal. Check with supplier to determine percent residual asphalt content of emulsion. K = 0.90 for winter construction. The K factors have not been verified by extensive controlled field experiments and therefore should only be used as a guideline. Refer to Appendix B for a sample calculation.